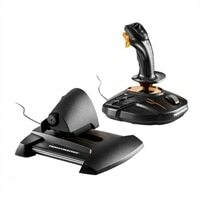 ThrustMaster T.16000M FCS Hotas - Joystick and throttle - wired - for PCThe T.16000M FCS HOTAS has been designed for advanced fliers looking for comprehensive, realistic controls as an alternative to using a mouse and keyboard. It is composed of the T.16000M FCS (Flight Control System) flight stick and the TWCS (Thrustmaster Weapon Control System) throttle.Thanks to its design and ergonomics, the T.16000M FSC HOTAS provides players with multiple recognizable features, allowing them to become more effective and accurate when in flight. This enhanced access to flight controls proves even more essential when players are fully immersed in the exceptional flight experience delivered by VR-compatible games. The T.16000M FCS HOTAS is the most natural and intuitive way to sit in a cockpit with one's hands on the throttle and stick. The T.16000M FCS HOTAS has been designed for advanced fliers looking for comprehensive, realistic controls as an alternative to using a mouse and keyboard. It is composed of the T.16000M FCS (Flight Control System) flight stick and the TWCS (Thrustmaster Weapon Control System) throttle.Thanks to its design and ergonomics, the T.16000M FSC HOTAS provides players with multiple recognizable features, allowing them to become more effective and accurate when in flight. This enhanced access to flight controls proves even more essential when players are fully immersed in the exceptional flight experience delivered by VR-compatible games. The T.16000M FCS HOTAS is the most natural and intuitive way to sit in a cockpit with one's hands on the throttle and stick.